This article is a response to an article written by William Howe and Hugh McIsaac that questions their recommendations that court-based mediation not be used when certain types of persons appear in court. We assert that it will be very difficult for the court to identify these people. Further, we argue that mediation practice has advanced so far that even these persons (those with serious issues of domestic violence, substance abuse, and mental health) should be given an opportunity to participate in mediation before being referred to the adversarial court process. This is a follow-up to our previous “Comment” responding to an article by William How and Hugh McIsaac. Juvenile Court Corner: Why is CASA So Important For Our Juvenile Courts? Inside the secret court that helps victims of drug abuse keep their families together, article on the London Family Drug and Alcohol Court (FDAC), which has been pioneering a new approach to child protection cases in which one or both parents have drug or alcohol problems. Children of incarcerated mothers do not fare well. As a community we should attempt to make it possible for these children to have more and better quality contact with their parents. What’s Best For Children From Violent Homes? 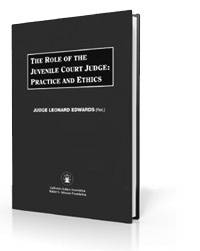 This is the introduction to Judge Edwards most recent book, The Role of the Juvenile Court Judge: Practice and Ethics. While it focuses on California law, it is generally applicable to juvenile court judges in all states. “Active Efforts” and “Reasonable Efforts”: Do They Mean the Same Thing? The Role of the District Attorney in Juvenile Court: Is the Juvenile Court Becoming Just Like Adult Court? 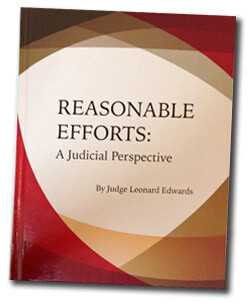 This case law review was presented to the Assigned Judges at their conference in October, 2017. This is a trial court decision concerning whether a child can determine the medical treatment she will receive. It was publicized all over the world. This is the only time a jury has been convened in a juvenile delinquency case in California.